A lot of entrepreneurs struggle with unworthiness, but very few are willing to talk about it openly. It’s not the easiest subject to tackle, because it’s not exactly something you want to put on display. Like with any feelings, the more power you give to your sense of unworthiness, the more havoc it can cause. Unwanted feelings pass, but when you’re in the middle of feeling unworthy, it certainly doesn’t feel that way. The feelings we experience arise from the stories we tell ourselves (ex. I’m not good enough). It always helps to remember that you are not your feelings, nor your thoughts, but the observer of them. Imagine yourself watching a movie. You can get immersed in the movie and feel like you’re there, but ultimately you are the one watching the movie. The same is true for life. Unworthiness is the feeling that you are not appropriate or suitable for what you’re doing or getting. This happens a lot for online entrepreneurs. A good example is if you’re creating your first product. You will probably run into feelings of not feeling good enough, and not knowing what you’re doing. It happens to the best of us, and it’s normal to feel that way. It’s not until you take action that you see that those feelings and thoughts of unworthiness aren’t entirely true. I’ll talk more about that in just a second. What Does Unworthiness Look Like? If you want to get to the bottom of how unworthiness manifests in your life, start observing your thoughts and the stories you tell yourself. In what circumstances does it pop up for you, and what thoughts does it bring up? Why would anyone buy my products? No one will like my writing, so why should I try? You may have your own versions of the above, but it’s all the same stuff. Thoughts and stories are swirling in your head that are making you feel bad. Where do all these feelings come from? Why do you feel bad about putting out products, writing articles, or doing what you feel like you should be doing? The biggest part of it comes from what you’ve taken in from society, friends, parents, and other sources. And now you’re attempting to earn money creating helpful products on your blog, so it’s only natural that your “inability” to write should pop up. The thoughts, feelings, and stories we have can feel so real that it’s easy to believe that getting rid of them is impossible. The good news is that you can eliminate feelings of unworthiness. But it only happens when you are truly ready. If unworthiness is caused by your thoughts and your stories, the way out is to examine what exactly is behind your pain and suffering. A good example from my own life was when I was creating Passionate Living (the latest version has a new name, but more on that below). Sure, I felt unworthy of giving advice on how to live a life full of passion. But when I started looking deeper, I discovered that I was trying to think what people would like, instead of sharing my own experience, which is all I can do. I couldn’t possibly know what other people thought. I knew what troubled my readers. I had their frustrations and problems in front of me, and my writing didn’t start to flow until I allowed myself to share what I had to share. As I kept writing and working on Passionate Living, I had my doubts, but I kept on writing and doing my best. When I released it to my audience, it sold well, because I was answering the questions my readers had and solving the problems they were experiencing. It has to date sold almost 200 copies and it keeps selling without me doing any pushy promotion for it. I keep getting emails from people thanking me for the content in it. I am astonished at this, because it shows me how wrong I was. I thought I had nothing to contribute, and it kept me from almost starting Wake Up Cloud altogether, but could I ever be absolutely sure that I had nothing to give to the world? The honest answer is no, and when you look at your thoughts on unworthiness, I think you will discover the same thing. They feel certain, but they aren’t. 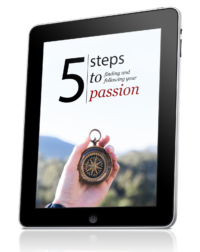 And today, Passionate Living has evolved into a full-blown course called Live Your Passion. I keep improving it, because people keep giving me feedback. You may, at times, be paralyzed by your feelings of unworthiness, which prevents you from taking action and getting real-life feedback. In those cases, you have to cut through the lies of your mind before you can move forward. And I recommend you do this even if you aren’t paralyzed, because improved clarity never hurts. The solution then is to be present with your unworthiness. This means getting curious about how your unworthiness feels, where in your body it is, when it happens, and what stories you tell yourself about it. When your mind starts diving into more stories, gently bring back your attention to what is going on inside your body. Become the watcher of your inner space, and do this each time feelings of unworthiness come up. Accept whatever happens, breathe, and be with it. Inquiry is a concept I’ve learned from The Work by Byron Katie. It’s the act of investigating your thoughts. Are they really true? When you inquire, you realize that almost none of your thoughts are true. The stories we tell ourselves are only in our imagination. And what you then realize is that reality is much kinder than the fantasy we mentally live in. Can you be absolutely certain it’s true? How do you react when you think that thought? That is the beginning, and as you can see, there’s no way you can be sure that you have nothing to offer. When I look back at all the negative feelings and moments I’ve experienced, I realize that they all had something to teach me. They were there for a reason. Those reasons can be hard to see in the moment, and can be easy to overlook as you get on with your life, but they are still there. Your feelings of unworthiness may be a nudge for you to dive deeper into your personal growth. Only you can discover the true meaning of your thoughts, feelings, and beliefs. Indeed quite sometimes we will struggling with our heart, whether we can make it or not, whether we’re suitable to do that or this or not. Including blogging, will sometimes wonder can I really make a huge stream of income supporting my life or will I fail. What if I didn’t make it in the coming year? Or even years? This is a fight within mind in the process. My readers motivates me, when they comments, like my page and blog post. It proof my existence in the blogosphere and I feel great about that. Thanks for the post Henri. I’ll keep walking stronger and better. Good to hear, Jia Jun. Keep rocking! You will find your answers if you take action, so keep on moving forward! Keep up the good work and do let me know how it goes! Hey Henri, i love your posts because your real and personable. Thank you for the gentle reminders. much success! Henri, every word and thought resonated with me. You have the skill of bringing into the open all of the unspoken thoughts of an entrepreneur and writer. You are an inspiration to me. You are a winner and a true motivator. I appreciate it, Lee. Awesome! I just stumbled across your blog a couple weeks ago, and I’m digging it! Feeling unworthy is something that I battle in a lot of areas of my life. Your post reminds me of how I thought of myself before I started volunteering through a church. I couldn’t really see that I had anything to offer because I wasn’t an expert in any one area. Eventually, I realized that I didn’t have to be the best in the world at something in order to simply help out. For me, just being willing to try can be the toughest thing. Glad to have you here, Phil! I think everyone can identify with what you’ve said. Our mind has a funny way of playing tricks on us. Great post Henri. It’s all about being authentic and trust that the best thing we can offer to the world is the true version of ourselves. Well written. I know sometimes unworthiness comes from comparing yourself to others. Like why should I be writing about this topic when there are so many better people out there already writing about this? That’s a common one. I’ve been there and done that. But then again, what if your article, from your perspective, can change even one life? And if you really want to write about that topic, then why not? Who cares if others have written about it? This was just what I needed! Thanks for sharing and keep writing. This is a timely subject for me. Recently, I had a realization about a certain event in my life 20+ yrs ago that I could never get to the bottom. To explain to myself or others. In the last 3 weeks it came to me, in the shower as usual, that what was at the core of my emotion was unworthiness. This final understanding and knowing has opened up doors to other events in my life and I look back with sadness that I felt so unworthy about myself. I’m not there now but have brief moments occasionally. The feeling of worthiness gets us now where and all of us can acknowledge it but push it out asap. Then go forward. We are stagnent if we are stuck in low self worth. Been there and I can say its not reality but a fictional feeling. One that is made up. We are all worthy. You’ve explained it much better than I. Thank you. ps Is there such a thing as a H20 proof laptop?